ENGINE The new 250 XC-F engine is based on the similar overall design of its predecessor, with some major refinements to make this power plant more compact and lighter, with the production of improved torque and power across the entire rpm range. Perhaps one of the most impressive benefits of the new design is a weight reduction of 2 lbs, while still including the incredibly beneficial electric starter. The reworked engine guarantees an improved power curve over the entire rev range up to 14,000 rpm, which makes the new 250 XC-F a winner for both amateur and professional riders. CYLINDER HEAD The centerpiece of the compact DOHC (Double Overhead Camshaft) engine is the new cutting-edge cylinder head. It features improved combustion chamber geometry, two 150 g lighter overhead camshafts with new timing, plus a friction-optimized super-fine surface, new finger followers with a 30 % harder DLC coating and a reworked timing drive (friction reduced and shorter DID timing chain, new sprockets and chain guides). New valve springs and retainers for the four lightweight titanium valves (intake 32.5 mm, exhaust 26.5 mm) and high-flow ports create a maximized flow rate for an optimal power band and maximum performance, all the way up to a redline of 14,000 rpm. CYLINDER & PISTON In the reworked and shorter cylinder that has a bore of 78 mm, is a weight-reduced, forged bridged box-type piston made by CP. It features a unique piston shape adapted to the new combustion chamber and stands out with its extra-rigid structure, combined with a low weight. The compression ratio is at 14.4:1. Thanks to the low oscillating masses, the engine offers extremely lively characteristics. 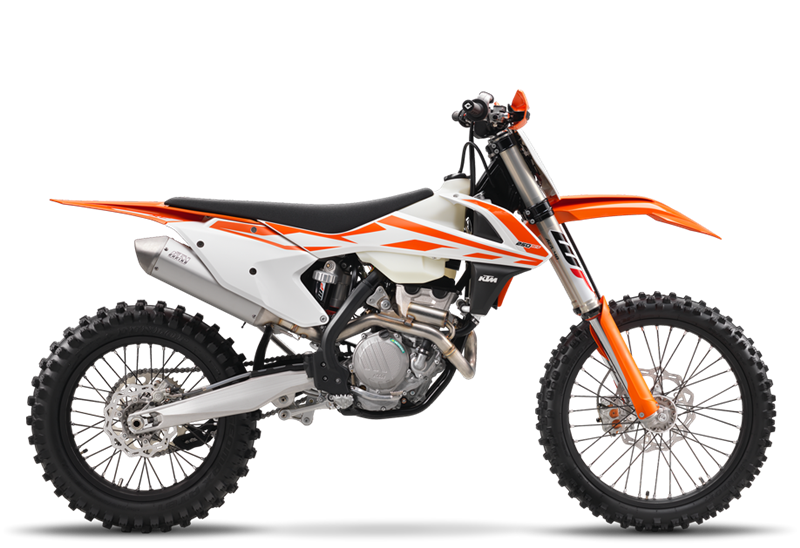 CRANKSHAFT The new 250 XC-F's crankshaft features a stiffer design and employs a 6 mm shorter connecting rod, contributing to the compact and light engine with a snappy power delivery. A plain big end bearing features two force-fitted bearing shells run directly on the crank pin. This design is a major prerequisite for the extremely high engine speed levels and the unrivalled maximum power of the 250 cm³ engine. Not only that, it enhances the engine's durability, allowing long crankshaft service intervals. COUNTER BALANCER SHAFT In order to balance the mass-forces, the new 250 XC-F engine uses a multifunctional counter balance shaft that also drives the water pump and timing chain. It features new sprockets fitted to the new timing chain. ENGINE CASES AND COVER The completely new design of the die-cast engine cases allowed for a much more centralized shaft configuration. The engine is now shorter by 20 mm, contributing to a much more centralized mass. Newly designed engine covers made of magnesium feature an advanced surface structure reducing the wear caused by the rider's boots. ELECTRIC STARTER The new 250 XC-F is fitted with an electric starter as standard, which a clear advantage in the heat of battle. A new starter motor made by Mitsuba (modified for easy disassembly) and a weight-reduced starter drive guarantees more efficient and reliable starting. TRANSMISSION The new engine is fitted with an all-new and weight reduced, six-speed semi-close ratio gearbox. One of the new and special features on the bike is an advanced "NO-DIRT" gear lever design, which prevents dirt from blocking the joint of the lever and guarantees a safe activation of the transmission. CLUTCH The highly compact CSS clutch (Coil Spring Steel) features a weight reduced, wear-free steel basket, and now seven instead of eight clutch plates, which are extremely heat resistant due to their steel carrier discs. In addition, a reworked inner hub and a pressure plate guarantees a better oil supply along with even better cooling of the clutch. A smaller master cylinder diameter of the Brembo hydraulic clutch system provides lighter pull and precise modulation. ENGINE MANAGEMENT SYSTEM The completely reworked Keihin Engine Management System with electronic fuel injection features an all-new 44 mm throttle body, which provides instantaneous response and maximum performance thanks to a revolutionary injector position. The new ECU (Engine Control Unit) includes a launch control for more efficient starts with the provision of different maps according to the gear sensor selection. In addition, the rider can activate an optional map for a different power delivery via the map select switch on the handlebar. AIRBOX The new airbox design offers maximum protection of the air filter against soiling, while ensuring maximum airflow in conjunction with lighter intake snorkel that is made of a new material to reduce the deformation due to air intake pulse for improved performance. The new Twin Air filter is easier and safer to mount and can be changed without tools in seconds - a standard and original KTM feature. BATTERY AND WIRING HARNESS As in the past, all new XC-F engines are fitted with the proven electric starter - a unique KTM feature and a major benefit at all levels of motocross racing. For MY 2017 the XC-F range fits a super compact and lightweight lithium-ion starter battery, providing safe starting of the engine while reducing the weight significantly. SEAT Ergonomically perfect, the new seat has a higher foam volume, which offers great comfort and durability, while weighing the same as the previous model. BRAKES High-tech Brembo brakes have always been standard equipment on KTM off-road bikes, and now are combined with newly designed and weight-reduced Wave discs made by GALFER featuring improved heat resistance. Weight reduction is 63g on the front disc, and 32 g for the rear. This is the ultimate solution in braking technology. FRAME The new frame design provides approximately 20 % higher torsional rigidity and 30 % less longitudinal stiffness, with newly designed engine stays for less vibration. This increased flexibility results in better absorption of the energy created from the front and rear wheel loads supporting the suspension for more comfort and less rider fatigue. A 0.4° steeper steering angle and a 10 mm shorter wheel base contribute to better handling and last but not least it´s around lighter than the previous model. FOOTPEG A new sophisticated "No-Dirt" footpeg solution prevents dirt from blocking the pegs in order to keep them in the correct position, even when dragging in deep ruts. In addition, the new footpegs are larger, lighter and more stable, providing better grip . BODYWORK For the new generation of XC models the KTM factory riders were involved in shaping the bodywork together with the specialists from KTM R&D and Kiska Design. The goal was to achieve complete harmony between rider and bike down to the finest details. The results are all-new plastics that provide perfect ergonomics and contact points for the rider, maximum freedom of movement, a lower seat height of between 10 to 20 mm (rear end) and better comfort, especially in the rear part of the seat. SWINGARM As on the predecessor models, the new XC-F generation features a reworked cast aluminum swingarm. The updated design offers reduced weight and an optimized flex behavior supporting the frame and suspension created with a single-component casting process. The weight reduction is 250 grams. 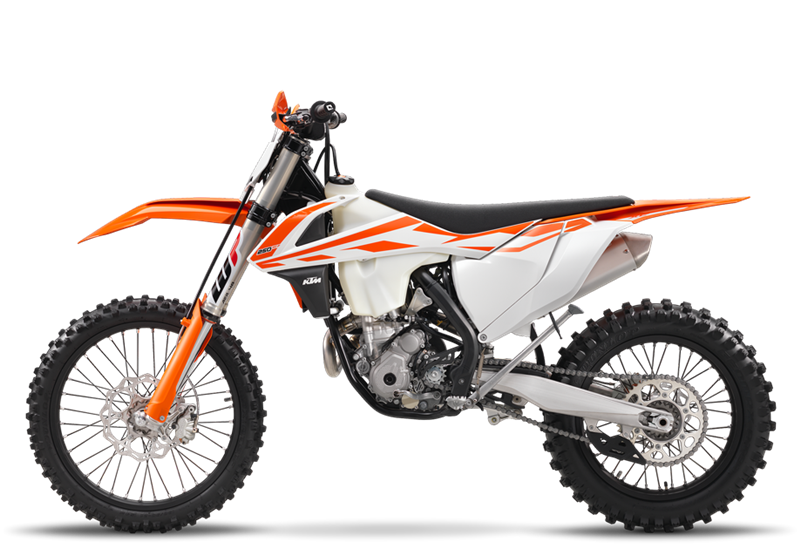 GRAPHICS New modern in-mold graphics highlight the Ready to Race character of the cutting-edge 2017 XC-F range of bikes. FUEL TANK All XC-F models have new lightweight polyethylene tanks fitted with an integrated fuel pump system and capacity of 2.25 gallons. Inside threads on the filler cap make for an easy and reliable closure. HANDLEBAR The new generation XC-F models are equipped with a new tapered handlebar made of high-strength aluminum by NEKEN, which is fixed in a new rubber damped handlebar clamp allowing the handlebar to be mounted in two different positions. All 4-Stroke models feature a new throttle assembly with model-specific throttle cams for different opening characteristics and new ODI grips featuring lock-on fixing clamp on the left-hand side. COOLING SYSTEM The proven integrated KTM cooling system routes the coolant from the cylinder head through the frame triangle, directly to newly developed aluminum radiators made by WP, which have a new filler cap system and are made of a stiffer alloy. Due to flow-optimized internal circulation and CFD-calculated air ventilation, the cooling efficiency has been improved by approximately 10 %. Sophisticated radiator guards provide efficient protection in case of crashes. FORKS The KTM XC models feature the advanced WP aer 48 fork for 2017. The AER 48 fork has been specifically designed and adapted for off-road riding conditions in the USA. MONOSHOCK The new generation of monoshock made by WP Suspension has been developed for the new XC models in conjunction with the new frame and swingarm architecture, including the reworked linkage system and the new WP forks. The new body features a revised reservoir for a larger gas chamber to reduce performance fade. The linkage system has also been reworked with a revised geometry and longer pull rods. WEIGHT REDUCTION The main target for the KTM engineers when developing the new XC-F generation was a massive weight reduction in conjunction with improved handling. The resulting loss of 5 lbs is outstanding, making the new KTM models the lightest bikes on the track, even with electric starting. TRIPLE CLAMP Top quality, CNC-machined triple clamps have been something of a KTM trademark for years. Ensuring precise handling, they provide proper clamping force for correct flex characteristics, thus improving the action of the forks. For 2017 the upper triple clamp features a newly developed rubber damping system for the handlebar clamp in order to reduce the vibration levels felt through the handlebar. The clamps retain their forward and back adjustability for rider preference.